Clove trees (Eugenia aromatica) produces two cm long pink flowers that can be picked as buds and dried. These buds when dried turn brown, and at this point are referred to as cloves. Cloves are a common spice found throughout the World and have been historically recorded to be used by humans for thousands of years. Cloves are produced commercially mainly in Africa, but Brazil, India, Sri Lanka and Madagascar also export cloves. Cloves have been shown to possess medicinal properties in animals and humans, and this likely relates to the presence of essential oils in their flesh. The essential oil in cloves may possess antibacterial and antiseptic properties that make it useful in the treatment of infections. Some evidence also suggests that the essential oil is a mild anaesthetic, which is why it can be found in throat sprays and mouthwashes. The essential oil in cloves may also be beneficial to digestive function through the stimulation of acid secretion and peristalsis. Eugenol is thought to be mainly responsible for the distinctive aroma and the warm taste of cloves. 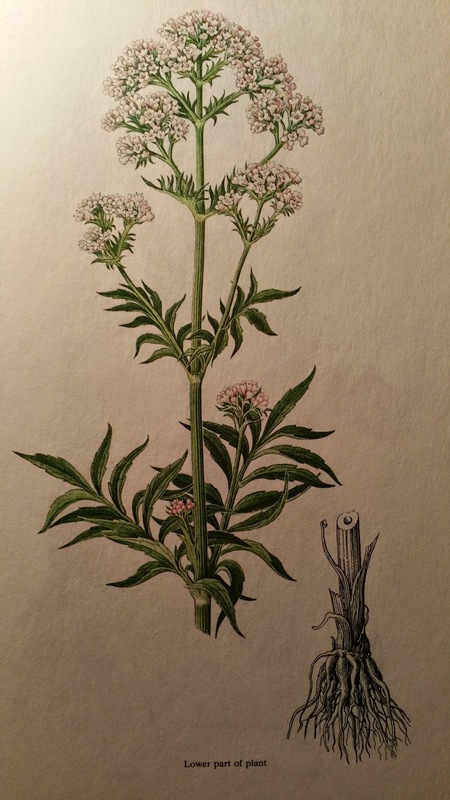 Many of the medicinal properties of the essential oil may relate to the presence of eugenol. However, other substances have been identified in cloves. The presence of methyl salicylate explains some of the pain relieving effects of cloves. Beta-caryophyllene is a sesquiterpene found in cloves, as well as the herb rosemary (Rosmarinus officinalis), hemp (Cannabis sativa) and black pepper (Piper nigrum), and may possess anti-inflammatory effects in animals. Measurements of the reducing power of cloves shows them to possess one of the highest antioxidant capacities of all spices. This may be explained by the presence of tannins, the flavonoids kaempferol, rhamnetin and eugenitin; as well as terpenes. However, it is likely other unidentified substances may also contribute to the reducing power of cloves. Cloves may also contain stigmasterol and campesterol, plant sterols that may affect plasma cholesterol levels. Flavonoids are polyphenolic secondary plant metabolites. These molecules are often responsible for the red, blue and purple colours in fruits and petals. Flavonoids are bioavailable in humans and may have important biochemical properties in animals. For example, flavonoids may be important antioxidants and also be able to regulate gene expression. Health effects of dietary flavonoid have been extensively researched, and flavonoids may provide protection from cancer and cardiovascular disease. Many flavonoids are present in edible plants and so form an important component of the human diet. Flavonoids are a diverse group with thousands of examples in plants. However, only a much smaller amount are present in edible plants commonly consumed by humans. The prospect that many important dietary flavonoids have not yet been identified is highly likely. Fruits, vegetables, tea, wine, herbs, grains, seeds and chocolate are all important sources of flavonoids. The flavonoid structure is based on a C6-C3-C6 diphenylpropane skeleton. Flavonoids are subdivided into the categories flavones, flavanones, flavan-3-ols, anthocyanins, based on the oxidation levels of their central pyran ring. Within the subgroup, hydroxylation patterns on the A, B and C ring define different flavonoids. 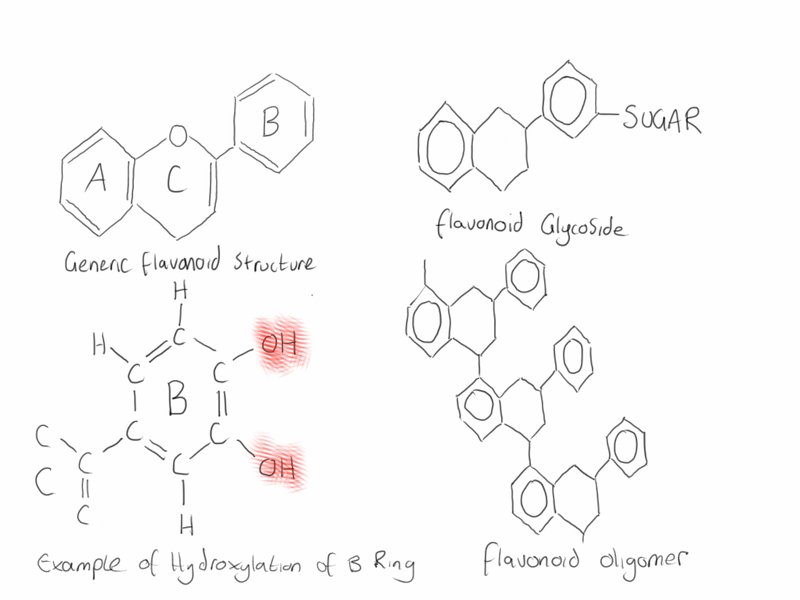 Further, sugars can be added to the basic flavonoid structure to create further diversity. Addition of a sugar molecule forms a flavonoid glucoside if the sugar is a glucose molecule, or a flavonoid glycoside if some other sugar is involved. Flavonoids without sugars are referred to as aglycones. Flavonoids can also bond together to form complex oligomers. For example, the flavan-3-ols can bond together to form high molecular weight proanthocyanidins, which are found in chocolate, grape seed and pine bark. Many plant secondary metabolite have similar structures to flavonoids and are often grouped together including the chalcones, isoflavones and aurones, but these are not true flavonoids. Hydroxycitric acid (HCA) is a compound found in certain species of plant. Commercially hydroxycitric acid is most commonly extracted from the fruits of the Garcinia cambogia, Garcinia indica and Garcinia atroviridis plants. Hydroxycitric acid is interesting nutritionally because it may be an effective weight loss aid. Both animal and human studies have been performed using hydroxycitric acid, with evidence supporting a role for its weight loss effects. Hydroxycitric acid is different to many weight loss supplements because it does not stimulate the central nervous system through agonism of beta adrenergic receptors. Studies investigating the biochemistry of hydroxycitric acid show that it may cause weight loss through its ability to alter the metabolism of carbohydrates. In particular, hydroxycitric acid is able to inhibit the mitochondrial enzyme ATP citrate lyase, an important enzyme in fatty acid biosynthesis. 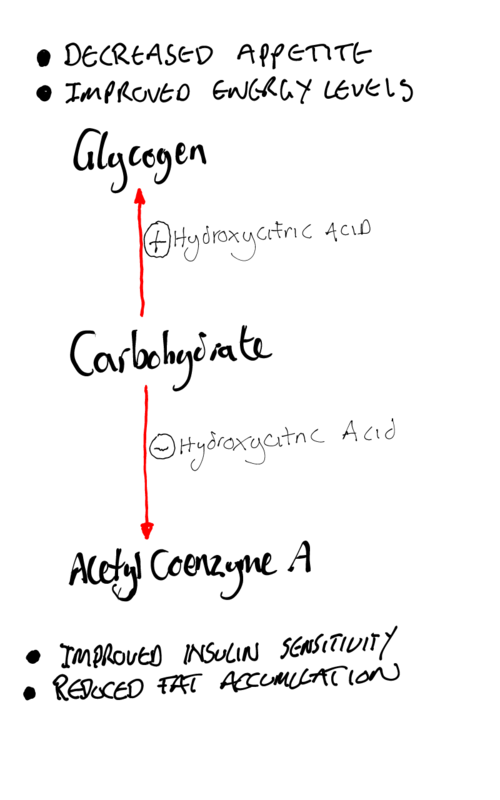 By inhibiting this enzyme, hydroxycitric acid decreases the synthesis rate of acetyl coenzyme A (acetyl-CoA), which is used as a building block for the synthesis of fatty acids (figure1). Figure 1. The possible weight loss effects of hydroxycitric acid. Hydroxycitric acid is therefore an inhibitor of the de novo lipogenesis pathway, and in this way may be able to reduce the conversion of carbohydrates to fatty acids in the liver. Although it is often assumed that this is beneficial because it causes a reduction in the accumulation of fatty acids, which in turn decreases the availability of triglycerides for deposition in adipose tissue, this theory may be too simplistic. Activation of the de novo lipogenesis pathway by high intakes of fructose are thought to increase the risk of developing insulin resistance. The resultant fatty acids accumulate in liver and skeletal muscle and are thought to interfere with the insulin signal cascade. By reducing flux through the de novo lipogenesis pathway, hydroxycitric acid may limit the damage caused by the accumulation of ectopic lipids. By inhibiting ATP citrate lyase, hydroxycitric acid may also increase the pathway that leads to the synthesis of glycogen, the storage form of carbohydrate in the liver. As full glycogen stores feedback to the central nervous system to induce satiety, hydroxycitric acid may also be an effective appetite suppressant. Vitex (Vitex agnus-castus) is an Asian and Mediterranean deciduous shrub also known as the chaste tree, chasteberry, monk’s pepper tree, Abraham's balm and wild pepper. Vitex grows to between six and seven meter tall and medicinally the peppercorn-like berries of the tree are useful in the treatment of female reproductive disorders. However, some reports also suggest that the small lilac flowers also possess similar medicinal properties to the berries. Traditionally the vitex was considered able to lower the libido, hence its name the chaste tree and hence why it was drunk by monks in high amounts. Historical records show that it has been used for this purpose at least since Roman times. More recently the use of vitex have been confined to the treatment of female reproductive health issues. In particular, vitex may relieve some of the unpleasant effects of menses and the menopause because of its balancing effects on hormonal regulation. It is also used as a galactogogue to increase milk production in lactating mothers. The active constituents of vitex include the flavonoids isovitexin, orientin, casteican and chrysophanol D; iridoids such as aucubin, a p-hydroxybenzyl derivative of aucubin called agnuside, and eurostile; volatile oil which is composed of mono- and sesquiterpenes including cineol, pinene and limonene; the essential fatty acid linoleic acid, carotenoids; and vitamin C. Animal experiments using rats suggest that extracts of vitex are able to lower prolactin levels and in this way affect hormonal regulation. However, it is unknown which component of the plant is able to cause this biochemical effects. Mechanistically, vitex may reduce prolactin levels through a direct stimulatory effect on the dopamine receptor. In addition vitex may increase progesterone levels at the expense of oestrogen though an inhibitory effect on follicle stimulating hormone and a stimulatory effect on luteinising hormone. As well as its effects on female reproductive function, vitex may also have antioxidant effects in humans. Leptin is a peptide hormone that was discovered in 1994 by a Scientist called Friedman. Fat cells produce leptin and this signal is used in a feedback loop to allow the maintenance of correct body weight. Mice missing the leptin gene (ob/ob mice) grow incredibly fat because their hypothalamus does not receive a leptin signal from the adipose tissue. As a result appetite and energy utilisation are not modified in response to growing adipocyte stores and the mice become incredibly fat. However, when these mice are injected with leptin, they return to near normal body weight in a very short time because the leptin signal causes an increase in energy expenditure and increased activity. When this was discovered it was hailed as a breakthrough in obesity treatment. It was assumed that obese human like ob/ob mice had a deficiency of leptin, and injecting them with the peptide hormone would return them to normal weight. However, there was a twist to this story that researchers did not anticipate, which left them disappointed. When obese humans were injected with leptin, there was no weight loss effects. The reason for this is that obese people do not have low levels of leptin like the ob/ob mice. In fact obese humans have levels of leptin that are higher than normal. It is not the signal from the adipocytes that is faulty, but instead the interpretation of that signal by the hypothalamus. In obesity the hypothalamus becomes insensitive to the leptin signal, and so despite high levels of leptin, their appetite and energy regulatory systems are not modified in response to gaining weight. The leptin resistance is thought to be a secondary consequence of insulin resistance, which in turn is believed to be caused by eating a low quality diet high in sugar. The fructose component of the sugar increases flux through the de novo lipogenesis pathway, and this creates fatty acids that accumulate in tissues and interfere with the insulin signal cascade. There is no miracle injection that can reverse this process as for the mice, only eating a high quality diet is effective. Vitamins are essential organic compounds needed in small amounts for normal metabolic regulation, usually as cofactors to enzymes. They are characterised in their own group because they cannot be synthesised in the body and so must be obtained from the diet. Vitamin research is ongoing, and in this respect the roles of vitamins in human nutrition has changed over time as more research has been undertaken. This has lead to the inclusion of certain substances in the category of vitamin, despite not really belonging to the group. The most obvious vitamin that is not a vitamin is cholecalciferol (and ergocalciferol), otherwise known as vitamin D. As vitamin D can be synthesised in the skin through the action of ultraviolet light on cholesterol, it is not a vitamin. In fact vitamin D is a steroid hormone belonging to the same category as testosterone, oestrogen, progesterone and cholesterol. Adequate sunlight exposure provides all the vitamin D that is required for correct metabolic regulation. Likewise, vitamin A is not really a vitamin as it can be synthesised endogenously from other compounds. Beta carotene and other carotenoids present in plants can be converted to vitamin A in humans and as such are referred to as provitamin A. The ability of other compounds to provide substrates for vitamin A synthesis in humans has resulted in the use of retinol equivalents (RE) in the labelling of foods, a measure that ensures that the provitamin A content of foods are included. Of course carotenoids have a wide range of activities in human tissues and may also be effective antioxidants. Another vitamin with a dietary precursor is niacin. Niacin is also sometimes referred to as vitamin B3, however, dietary sources of niacin might not be required if adequate tryptophan is supplied in the diet. This is because dietary tryptophan is converted to niacin through the kynurenine pathway, and about 60 mg of tryptophan can be converted to about 1 mg of niacin. Some foods are low in niacin, but are paradoxically good sources of the vitamin because they contain high amounts of tryptophan. Controversy also surrounds the production of certain substances by the intestinal microflora. From a holistic point of view the bacteria inhabiting the gut are part of the human host and the vitamins they synthesise in some cases may provide adequate amounts of the vitamins for normal metabolic regulation. The total absence of vitamin B12 from the diets of vegans is a case in point. Only animal foods contain vitamin B12, but vegans do not consume these products. While the vitamin B12 status of many vegans is poor compared to meat eaters, they do not by default develop the anaemia associated with deficiency of the vitamin. This may be due to the synthesis of the vitamin by small intestinal gut bacteria, which is absorbed in the normal way through bonding to intrinsic factor in the gut. Likewise vitamin K can be synthesised in the gut by bacteria, and many provide adequate amounts of the vitamin in healthy individuals. The symbiotic relationship between bacteria and humans is pivotal to health and these organisms should really be considered to be part of the human host.